Born on September 7, 1928, Lessie Lee Edwards was one of eight children born to the late Matt T. and Lucy Jones Edwards in Jackson, NC. Lessie attended Coats High School and graduated second in her class. 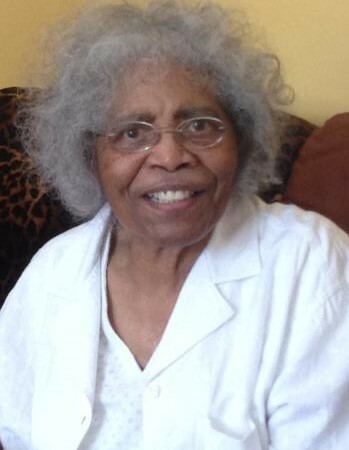 Her ambition was to become a nurse and in 1951 graduated from Durham’s Lincoln Hospital School of Nursing. Her professional career led her to New York Presbyterian Hospital with a primary focus in surgical nursing, then specializing in labor and delivery and behavioral health. On June 29, 1957, Lessie married long-time friend and army officer Robert “Bob” Futrell Jr. before he was stationed in Germany; and their “two year European honeymoon” as Lessie affectionately called it, started their 47 year marriage together. Being a military wife resulted in a lot of travel ranging from France, Belgium and Switzerland to Okinawa, Japan. Whenever they were stateside, Virginia was called home, and that’s where their daughter Crystal was born. Lessie accepted Christ early in life at Piney Grove Baptist Church (NC) however due to travel, a permanent church home did not become apparent until Bob retired from the military, Piscataway became home, and the Futrell Family joined North Stelton AME Church. On July 16, 1989, Rev. Kenneth L. Saunders appointed her to the Stewardess Board II, and was Vice President when the new church was dedicated in 1992. • Remember that it takes thousands of years to build character, but only one day to destroy it. Those left to celebrate her legacy include her daughter Crystal Futrell Hobbs; “adopted” son John M. Cooney; grandchildren, Jamie L. Thomas (Peter), Daniel J. Cooney (Madison); great-granddaughter Claire Catherine; and a host of family and very dear friends.